Word of Life Philippines (WOL), a part of the nondenominational Christian organization based in the United States, operate a 14-hectare camp ideal for youth camping, church and mission retreats and conferences. A slope situated less than 5 meters behind the camp’s canteen building was deemed to be in imminent risk of erosion and collapse by local government authorities. 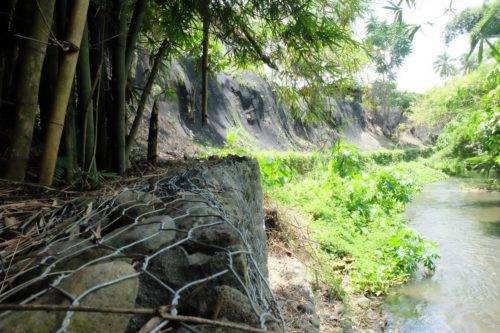 Maccaferri Philippines were then asked to provide lasting solution to the impending erosion control problem. A visit to the site was conducted last year. Despite heavy vegetation on the slope, closer inspection showed the upper portion of the slope to be partially eroded with deep cracks. It was apparent that the damage was caused by the absence of adequate drainage and surface erosion during heavy rains. Consideration also had to be given to the fact that the slope is a riverbank which, during heavy rains, is subject to rapidly rising and fast-flowing waters. Based on the slope profile, soil properties and the desire to allow this area to re-vegetate, an economical and easy to build erosion control system, addressing the unique requirements of the riverbank, needed to be urgently designed. The client advised that every effort should be made to implement a solution before the start of the next rainy season. Considering the height of flood water in the river, the solution proposed used a combination of Maccaferri gabions at the toe of the slope and MacMat R reinforced erosion control mat for the upper portion of the slope. This required the existing slope to be trimmed of unnecessary vegetation and, where appropriate, back-filling some portions of the slope to achieve a better profile. Further, it was necessary to install an interceptor drain canal on top of the slope to address surface runoff and to serve as the primary anchorage of the MacMat R.
Besides being a cheap alternative to other erosion control systems, MacMat R has the distinct advantage of fitting the slope geometry perfectly due to size and flexibility. The slope will promote vegetation making the site aesthetically pleasing. This is turn will enhance moisture-retention in the season and will continue as a permanent erosion control system throughout the life of the product. The project, completed shortly before the start of the rainy season, has stood up well to recent tropical storms and heavy rains. To learn more about our erosion control applications, do not hesitate to contact the Subsidiary of Philippines.